The Aurora-Donald interchange at I-5, Exit 278, is 60 years old, and it's due for a makeover. 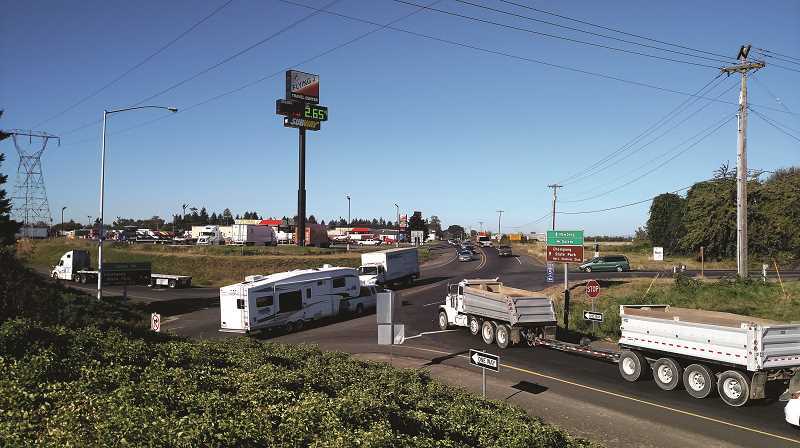 Oregon Department of Transportation will take the first steps toward that makeover this month when it meets with area businesses and other stakeholders in a workshop setting. That workshop marks the initial activity of a process that will culminate with a smoother, less-congested junction for motorists entering and exiting the freeway in the area of Ehlen and Bentz roads, roughly equidistant from Donald and Aurora. ODOT sources note that I-5 traffic has increased substantially over the past decade, while truck traffic alone is expected to grow by 40 percent in the same corridor in the near future. Engineers have monitored traffic at Exit 278 interchange, which contains three truck stops, and determined a number of issues need to be addressed, including the proximity of the roads, access points and visibility, which considering the traffic volume all create safety concerns. A project informational piece noted that each day about 32,000 vehicles use Exit 278 Aurora-Donald or travel past the ramps entering and exiting I-5 along Ehlen Road in Marion County. The six-decade-old interchange was originally designed for a much smaller traffic load, and ODOT officials said the traffic volume has exceeded its peak capacity for years. The redesign is a high-priority to ODOT, Marion County and the Mid-Willamette Valley Area Transportation Commission. Ehlen Road, which directly feeds and receives the interchange traffic, is a major throughway in north Marion County and provides access indirectly to Clackamas and Yamhill counties. Problems along that road at the interchange include peak-hour congestion, especially at the southbound ramp; conflicts between cars, recreational vehicles and commercial trucks; the additional traffic flows coming in from Bentz Road. Two potential design plans are currently being considered, and ODOT officials presented an overview to the cities of Donald and Aurora, and are scheduled to present plans to the Marion County Board of Commissioners May 22 Town Hall. Construction is anticipated to take place in 2022. House Bill 2017, also referred to as Keep Oregon Moving, has provided $25 million of the project's $28.3 million allotted to complete planning, design and construction of phase 1.